What Car Do You Regret Not Buying? We've all come close to buying a car only to decide at the last minute, for whatever reason, that it couldn't or shouldn't be done. What car do you regret not buying? If you are anything like me, looking at cars for sale is a necessary part of existence. Assessing their value, finding the deal of the century, dreaming about the car that you could never afford, it is a ritual practiced everywhere and anywhere there is an idle second and a car for sale. As a person combing the world for cars, it is an inevitability that eventually you are going to come across the perfect car you can't live without. This is the moment we love/dread and secretly what keeps us searching. You know the feeling, it is exactly what you've always wanted, it is too good to pass up, it is an amazing deal, and you can just barely afford it. You frantically get in touch with the seller, trying to hide your obvious desire for their vehicle while trying to get every possible detail about it as quickly as possible. If it is near you, you rush to see it. If it is on eBay or far away, you scrutinize every one of the 100 high quality pictures you politely demanded from the seller. You stay up at night thinking about it, you need to have it, and then, for whatever reason, you don't buy it. 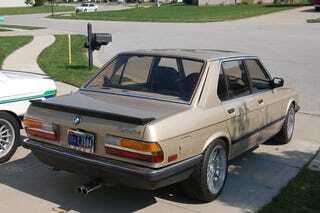 You know how it goes; you don't need another car, you don't have a place to keep it, your significant other/parents/landlord doesn't want it sitting in their yard, you don't have the money right now, you shouldn't buy a 25 year old modified BMW to rely on to get you to work on a daily basis. So you pass. Someone else buys it and you try and move on with your life, but you can't. It's happened to everyone. You still think about the car sometimes even though it is 5, 10, 20 years later. You see a similar car (or you don't) driving down the road and it brings up painful memories of the one that could have been yours. You would buy it in a second if you had a chance to go back in time. What car do you regret not buying? Although this newly minted car blogger could probably dedicate 10,000 words to this subject, the most recent car that haunts me is the 1984 BMW 528i seen here. It had euro bumpers, an engine from a 535i, E39 wheels and a story with accompanying salvage title that would turn anyone not a little bit insane away. I found it on eBay while looking for a daily driver last year and deciding not to buy it at the last minute is a decision I have spent a lot of time regretting. It has left me with a burning desire for a euro bumper 80s 5 series BMW (E28) which except if this car or another misfit like it comes up for sale again, I cannot afford or justify. So tell me, what is the likely less obscure and more understandable car or truck that you didn't buy but wish you had?